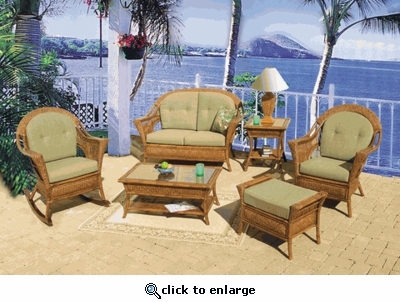 With broad curves and high gloss rattan poles, this set is ideal for your covered porch, game room, or family room. A high quality natural rattan frame is skillfully handcrafted combining split rattan accents and hand-woven natural wicker in a distinctive herringbone pattern. Available in Pecan finish.